Foodies of the world, unite! ... And come to Prague! Prague is going through a food revolution at the moment, and there is something here to satisfy everyone's taste. Not only is there great (and now, fresh!) traditional Czech cuisine of a high quality available, there is also topnotch Vietnamese, Japanese, Italian, Sardinian, Thai and, for lack of a better word, "nouvelle" cuisine, not to mention all of the "fusions" that are around. Some places are also doing updated versions of Czech classic cooking, and even gelato vendors are getting into the "farm-to-table" movement, conjuring up fresh and inventive flavors using local, seasonal ingredients. And Czech brewers have taken to the microbrewery trend like nobody's business, offering incredibly delicious unfiltered, unpasteurized beers and ales of all varieties, made with delicious Czech world-famous hops. And if you happen to get a hankering for gelato while you're in Prague, you can indulge in some of the best that you'll find outside of Italy. My favorite is Angelato, whose delicious seasonal concoctions are made fresh every morning with in-season, local ingredients. In the autumn you can sample mascarpone and fig, pear and ginger, or poppy seed and plum. In the spring you have (real) mint or asparagus flavor. And year-round you can have the old standbys like vanilla, caramel, or possibly the best pistachio on the planet! 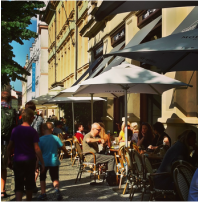 So while Prague used to be known for its bland, rather heavy food, it's now become a place where people come to satisfy their culinary urges, and deciding where to eat can be difficult because of all the equally good and interesting choices available. And even the local fare isn't quite as bland anymore. As you might be able to tell, I'm a MAJOR foodie, and my unique Prague Guidebook offers a good selection of some of the best places to dine in Prague.